In the early 1960s, Chan Chak-man was a major figure in the HK knitwear industry who was a founding director of Hong Kong Woollen Knitting Manufacturers’ Association (香港毛織業廠商會, now known as HK Woollen& Synthetic Manufacturers Association) in 1963 and his industrial enterprises included Yue Fung Co (裕豐公司), Yue Fung Knitwear Factory (裕豐毛織廠), Yue Tai Knitwear Factory (裕大毛織廠), Yue Fat Machine Embroidery Factory (裕發機織廠) and in partnership with his British business partners he even opened a knitwear factory in Lisbon, Portugal in 1964, making him probably one of the first HK manufacturers to set up a factory in Europe. Unfortunately, like Ng Yue-kwong of Ng Yee Hing Weaving which was profiled earlier, Chan’s aggressive expansion in the early 1960s was fueled by the Canton Trust & Commercial Bank (廣東信託) and his empire faded into history after the Bank collapsed in 1965. Little is known about the early years of Chan Chak-man’s career but according to his bio in the HK Directory published by WahKiuYat Po, he studied post-secondary college prep at Chinese College (華人書院) in Hong Kong. A native of Dongguan in Guangdong province, he served on the board of Tung Koon District Society (東莞同鄉會) and was a director of Po Leung Kuk. Chan’s companies were major manufacturers of knitwear and handkerchiefs which were exported to the US and Europe through the help of major importers (some of these firms to be covered in greater details later as they were major contributors of the industrial development in HK). One of his American partners based on a lawsuit against him in 1965 was HK Advanced Knitwear Co, which was established in HK in 1962 by garment importer Larry Taylor of Knit Wits Inc and Minkap of California. 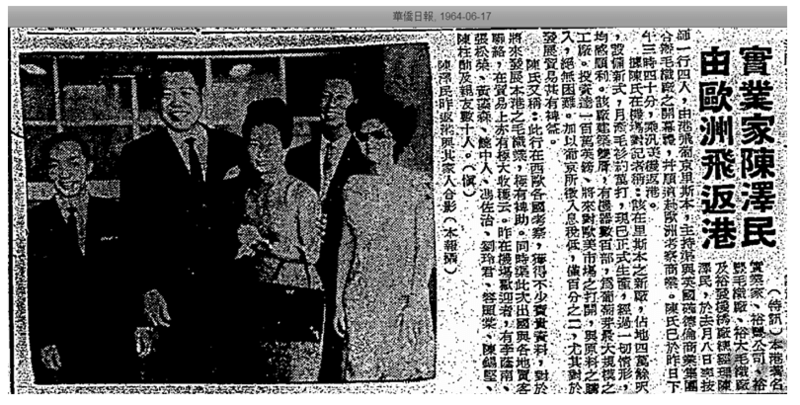 Another American importer whom Chan worked with was the New York importer (based on the Chinese name in the article could be Kilmer, to be confirmed) shown in below article who awarded him a million-dollar women’s knitwear contract in July 1962 which was expected to ship by air within a month with more orders to come in August. Another key business partner of Chan Chak man was Condax Agencies, a leading textile importer the UK founded by Isaac A. Codron (1897-1981). Isaac, also known as Haco, was the only boy among seven sisters and started out working for a Sephardi Jewish family by the name of Landau in London in the 1920s importing textiles from the Far East including HK and selling them in wide range of outlets in the UK ranging from the upscale department stores to Woolworths. He later struck out on his own and was supported in his business by his younger son David while his older son Sir Michael Codron became a famous Broadway producer. When Chan’s fourth son Chan Kwok-fun (陳國勳, who was manager of Yu Fat) married Lee Mo-kiu (李武嬌), the fifth daughter of Lee King-ming (李經明), a prominent Swatow lace merchant (and also member of HK Swatow Christian Church) in 1963, the reception at the Majestic Hotel in Kowloon was attended by over 1000 guests including representatives of all the major banks, trading and shipping firms in addition to members of the garment and textile industry. 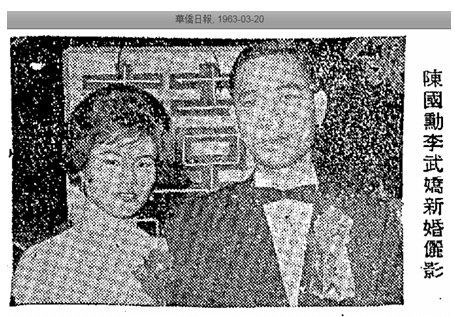 The main financial backer of the groom’s family – Chin Hing (陳伯興) of Canton Trust was chief witness (which highlights the close relationship between Canton Trust and Chan) and fellow Swatow lace merchant of the bride’s family – TseSek-fui of HK Old Mary Co (see article) was introducer. In 1964, Chan partnered with its British partner theCodrons to establish Windsor Knitting Factory (溫莎毛織廠) in Lisbon, taking advantage of the low tax rate in Portugal at the time. The total investments in the factory was over 1 million British pounds with several hundred machines occupying 40000 sq ft and was allegedly one of the largest factories in Lisbon at the time. The same year, Chan invested $5 million to build a 10-story factory building in San Po Kong with 8,000 sq ft of factory space on each floor. According to article below, the second floor was supposed to be office with showrooms and bar and a new dyeing division was added with $1 mil worth of new equipment and plans to move in May 1965. It is unclear if those plans ever materialized as Canton Trust went bankrupt went bankrupt and Chan Chak-man owed HK$2.4 million to Canton Trust which he could not repay, resulting in his personal bankruptcy in April 1966. He continued to be employed as manager of HK Handicraft Co at a monthly salary of HK$1000. This article was first posted on 7th December 2018.